is a Fine Art and Creative photographer based out of southern, CA. Sue is a lover all all creative expressions from being a published author, cover artist for books and ads and of course brings a unique spin to every photography session. Her passion for the arts has her offering workshops, mentorships and has her committed to the students at the Unraveled Academy. Testimonials: "I asked some previous clients why they chose me and these are the responses I received." Jennifer Ary Barnett: Why you…you treat my kids like your own and you listen to the general idea of what I want-then make it great. Also, you make my girls look like my girls-not posed or fake...I see their personality in ever photo. Cassandra Lohr: When you were taking Natalie's newborn pics I was embarrassed because she started peeing all over your props due to the fact she was naked. You were so calm and told me don't worry it happens, then helped me clean it up like it was no big deal and still continued to take pictures. When she cried you calmed her down. You were so good with her. Then we booked you for her one year photo shoot, at the time she was so attached to me and didn't want to be with anyone else but you brought out her personality and she loved you. You do great work and every picture is natural and amazing. Ashley & Byron Lugo …you're just that person that you feel like you have known for years, you LISTEN to what people want and twist it to make it even better.. We love how our photos turn out, especially me being plus size and weight conscious.. You can always make me glad I went through with pictures!! Courtney & Barton Maxwell: Why you! I met you by chance but absolutely adored you! You always look for happy moments in life that others may not see. You take a little idea and run with it. Your endless creativity sparks moments in life that will last forever. I would not trust just anyone with my vision, but you made me better as a person in every aspect. From my engagement pictures to my wedding day (even before those moments). I love Sue and all she has to offer! Through photography and friendship you are a pillar of strength and understanding! I will always have you by my side through any of life's moments! You are by far the best! Breeze Seabrook: It had been years since I had seen my son. I was on the fence about having a photo session done when he was coming into town. I was worried about us feeling comfortable. Sue instantly had us laughing, both my son and I. Those pictures are the background on my cell phone, my computer screen, all over my Facebook page and on my desk at work. I cannot explain how special they are to me. It felt like hanging out with an old friend and our pictures reflect a memory we had not some posed photo session. I now consider Sue a great friend and refer her to whoever I can. Kyle & Megan Heike: Anyone can take a picture. It takes a true artist to make that picture come alive. My favorite pictures are the ones you have taken of my children. Their personalities burst from those pictures and you were able to catch that special moment so perfectly. So very glad to have met you and looking forward to have you capture several more special moments in our lives. Stacey Carrero: I chose you for our family photos based on your shots of an old truck. LOL that sounds ridiculous, but really! After looking through your work it was obvious that you have an eye for real, natural beauty. Also, there wasn't a single person Looking anything less than gorgeous so either you only photograph beautiful people or you are just that great. AFTER meeting you it all makes sense, you make people comfortable, especially children! I see the essence of my childrens' spirits on their faces in the images you captured and you had only known them for 30 mins prior! Gina Vona Kadlec: Because you see creativity in things others can't. You have an imagination of a child, the skills of a master, and a heart of gold. Martha Kenny: Many tried, but only you captured our beautiful Danny's Christening picture! Kelly Nieminski: Your pictures stir up emotion and passion in a beautiful way, like NO other photographer's. Kasey Kristensen: Sue is so nice and was great with our family, including my 22 month old little monster. The pictures were amazing. I highly recommend her!! Andrea Bohn: Best Photographer in Southern California! So passionate for what she does!!! Love All of Sue's work.... Family, kids, weddings, boudior,,,, you name it..... She does it!!!!! Jessica Good Wolters: Sue was so patient and flexible with us, especially our son. So glad we made the drive up from San Diego! 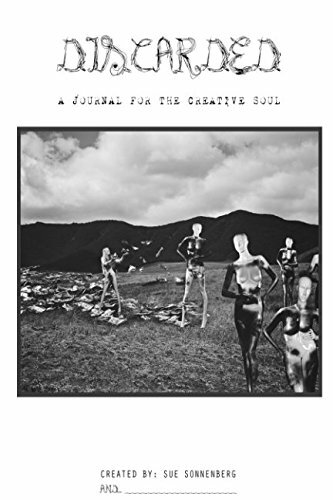 DISCARDED A Journal for the Creative Soul *** Is out now on Amazon!! !